Deep root fertilization applications are important for trees that grow and live urban and environments like Raleigh. Because these trees are often subject to conditions that stress the tree like Nutrient deficiency, soil compaction, low moisture availability, physical damage, construction, and competition from grass and other trees and shrubs. Stressed trees are far more likely to fall victim to insect attacks, disease, fungus and other biotic disorders that could kill the tree. Fertilizing your tree will help keep it healthy and vigorous.The deep root fertilization method that we use is fantastic for trees that are in need of nutrients and additional pore space in the soil. There are countless benefits to deep root fertilization, but the most notable are.Immediate supply of needed nutrients for hungry trees– Our deep root fertilization programs are custom developed for your tree’s needs. A soil sample will be taken to properly measure the existing macro and micro nutrients in the soil. Once we have determined the soil structure and existing nutrient content we will know how to amend the soil to better help the tree. We will make a custom blend liquid fertilizer solution to inject into the trees critical root zone. We are able to offer traditional fertilizers and organic fertilizers as well that are made from worm castings. All deep root injections are applied at a high psi between 2 to 8 inches deep. This is where the fibrous roots that are responsible for nutrient uptake are. Increased pore space for root development- Tree roots have a hard time developing in compacted soil, they need loose dirt with open pores. The trees roots need oxygen to survive, and that needed oxygen is usually found in the pores of the soil. When the ground beneath a tree is compacted it suffocates the roots and limits their ability to transport much needed water and nutrients to the tree. When we perform a deep root fertilization, it helps create new pore space and alleviates compaction issues. We start by mixing a custom blend liquid fertilizer. We then inject that solution into the ground with a deep root injection needle. 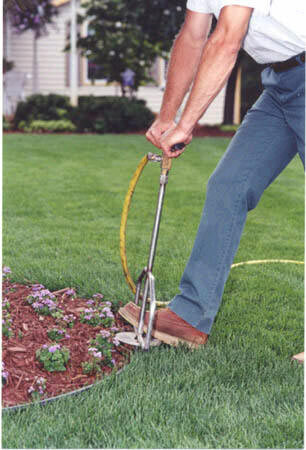 This needle is designed to shoot the fertilizer into the ground at a high rate of pressure. The liquid solution loosens the soil and the pressure causes it to expand, creating new pores.